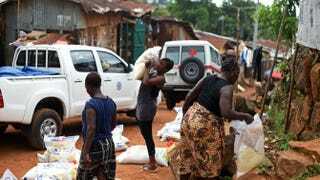 Approximately 1 million people living in the three West African nations most plagued by the Ebola outbreak—Liberia, Guinea and Sierra Leone—are at risk of going hungry because of major food shortages due to “border closures, quarantines and crop losses,” Al-Jazeera reports. Two food-monitoring groups, the United Nations Food and Agriculture Organization and the U.N. World Food Program, reported these findings on Wednesday. “The loss of productivity and household income due to Ebola-related deaths and illness, as well as people staying away from work, for fear of contagion, is compounding an economic slowdown in the three countries,” both agencies said in a joint statement. Trying to solve one problem—curbing the spread of Ebola—by restricting people’s movements inadvertently spurred another: the slowing down of the processes that drive the food markets. “Restrictions put in place to curb the disease were also ‘seriously hindering people’s access to food, threatening their livelihoods, disrupting food markets and processing chains, and exacerbating shortages stemming from crop losses,’” the joint statement continued. The aid groups say that approximately 500,000 people are in immediate danger of going hungry, and that number will double by March 2015 “unless access to food is drastically improved and measures are put in place to safeguard crop and livestock production,” Al-Jazeera explains.